Some laser hair removal machines can give you great results in the comfort of your own home for a fraction of what you would pay for professional treatments. The technology is moving quickly with at home hair removal systems, and many consumers have had great success with these easy to use devices. Before you dive right in and pick up a DIY product, there are a few things you need to consider first to have the best shot of it working well for you. All of the following devices are suitable for both men and women, and all are FDA approved for at home hair reduction. Only at home product that is a laser rather than IPL (so it is a bit stronger). It is the only over-the-counter device that uses laser diode technology, similar to what you would find at clinics, although at a reduced intensity. The laser targets the pigment in your hair and permanently disables the hair follicle’s ability to regrow hair. 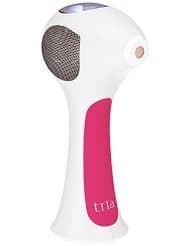 The Tria Laser has features that make it very easy to use and to help ensure that you don’t damage your skin such as a digital display with a pulse counter and a “sensor skin” on the bottom of the base, which you put over your skin to ensure you don’t damage your skin. It is intended to be used on smaller areas like underarms or around the bikini line, although you can use it for other areas, it will take a long time as the contact area where the laser touches the skin is very small. The Tria has five different energy levels that you can use. Many users report it can feel like a rubber band snapping on your skin, but it is a laser, so that is to be expected. Check this page (near the bottom) to see if you are a good candidate for Tria. What do users love about TRIA? Generally, users find the Tria to be well made, and it does effectively reduce hair growth. If you give it some time and follow the instructions to the letter and you are a good candidate for the Tria, most reviewers mention that it is easy to use and works as it is supposed to. It gives you the freedom to get laser hair removal at your own pace and in the comfort of your own home. Some users have found the 30-minute battery life to be too short to cover all of the areas that they would like in one session. The other big issue is that it is painful to use, although this can be minimized by using a numbing or cooling cream because it is laser there isn’t much that you can do about the pain. The head of this instrument is quite small making it difficult to do anything other than smaller areas like the face or underarm. The iluminage Touch is notable for being the first at-home FDA-cleared permanent hair reduction system for all skin tones. This system is straightforward and quick to use; most users report that they don’t have any pain or skin problems (even those who have sensitive skin) from using the iluminage. According to clinical tests conducted by iluminage 85% of users feel no pain whatsoever when they use the Touch, and some users get 40% loss of hair after two weeks, although you need to use it for about seven weeks to get a 94 percent hair reduction after one series of treatments. Goggles come with the kit but aren’t required. What do users love about the iluminage? Users have been getting great results from the iluminage. It is a well-made, innovative product that is using some of the latest and greatest technology to help get great results for a wider range of customers. The best thing about the iluminage Touch is that it is giving customers who don’t fit the traditional light skin and dark hair ideal for permanent hair removal an option to try out IPL hair removal for themselves. The Veet Infini’Silk Pro is one of the least expensive, yet effective, options when considering an IPL device for hair reduction. It is easy to use, has a skin tone sensor that won’t let the device fire if the skin tone is too dark. It has an excellent sized treatment area that makes it easier to do large areas like chest or legs. It is corded, so you don’t have to worry about the battery running out and having to recharge it in the middle of a session. What do users love about the Veet Infini’Silk Pro? The low cost, coupled with the excellent performance, make this product a great entry level device to get customers into at home hair removal. It has a replaceable bulb that is relatively inexpensive to replace. Most users love the large size of the treatment area; it makes doing a full body treatment that much quicker and more comfortable. Getting replacement cartridges can be difficult. See if you are a candidate for Veet’s Infini’Silk Pro by checking their color chart. Do at home hair removal systems work? Unfortunately, the answer to this is yes and no. These systems will work amazingly for some people, and not at all for others. Since the results can be pretty hit and miss, it is essential that you spend some time researching what may be the best device for you (if any). If you buy a FDA approved hair reduction device from a reputable source, what you will be getting is a product that has been tested on the same type of criteria that salon devices have been (clinical trials on hair counts and safety of the product), although at a lower power setting than you will find on professional systems. It is possible to get similar outcomes to professional treatments, but it will probably take you longer to get results due to the lower power settings of the over-the-counter devices. To figure out if you are a good candidate for at home hair removal, you will need to have a particular hair color (light brown to black), hair type (course/thick) and skin color (fair to light brown). A couple of devices have come out in the last few years that claim to work on a much more full range of skin and hair colors (see below). You also need to follow the directions and recommendations from the manufacturer very carefully to get the best results (which a surprising number of people don’t do). To do this type of at home hair removal, you are going to be looking at choosing between products that use either IPL or Laser technology. IPL stands for intense pulsed light, which is a type of light therapy that is used in different dermatological procedures such as hair removal. IPL emits different wavelengths of light that scatter within the skin and target pigment. The light then turns to heat that kills the growing cells that make the hair. Traditionally it has only been recommended for users with dark hair and fair skin, as that is the type of combo that works best with IPL (although newer devices have done clinical trials showing that they work with darker skin and some lighter hair shades). Similar to IPL, Laser treatments permanently remove hair by destroying the follicles with heat, although with much more focus on a particular follicle. A laser is generally considered to be stronger and more effective than IPL, as it has just one specific wavelength emitted from the diode depending on what you’re targeting. With Laser, you can explicitly set it up to target an exact pigment. Laser treatments are often more expensive and more time-consuming than IPL. As for which works better when doing at home treatments, most experts agree that laser is the better option if you are only treating a small area because the over the counter laser devices have stronger and more focused intensity than the IPL. Since the only brands that offer laser are a couple of Tria models which have tiny treatment areas, if you are looking to do a large area, you would be better off considering one of the IPL devices, since it will be less time consuming and easier to use. You could potentially damage your skin causing scarring or discoloration. The product doesn’t work for you, and you have wasted $500. All of the hair removal systems that have been approved by the FDA that are sold by authorized dealers have safeguards in place to prevent your skin from being damaged. They have skin color sensors that will check the color of your skin, and if it is too dark, the device won’t allow the flash to go off. Despite the safeguards, you could still damage your skin if you don’t use the product correctly. There is a relatively lengthy list of restrictions regarding who can use these products, and what areas can be treated (see below). When users choose to ignore the precautions is when scars or skin discoloration tend to occur. As long as you follow the directions and use any product you purchase correctly, you shouldn’t have any damage to your skin. back guarantee, so you have a little more time to figure out if it is working for you if you choose to purchase one of their products. You have epilepsy or suffer from chronic migraines. If you have an active implant like a pacemaker, insulin pump, incontinence device, etc. If you are taking any medication or supplements (some antibiotics, or antidepressants) that may cause hypersensitive skin. Don’t use it on areas with tattoos, moles, freckles, tans including self-tanners (up to 4 weeks after sun exposure) and dark brown areas. Before choosing the right device for you, there are a few questions to ask yourself, so you know what to look for when reading reviews and product descriptions. What areas are you planning on using this for? The main areas that users are looking to use these products for are the face, bikini area, legs and chest and back hair (for men). There are differences in the sizes of the devices that make some products better for particular body parts. The Tria has a pretty small contact area making it more useful for small areas like underarms or the face, while some of the IPL devices have larger surface areas making them more practical for areas like the legs or chest. With these at home treatments, the consensus is that the IPL devices are much less painful than laser. Since the laser is stronger and more directed to one point, the pain can be a bit more intense than IPL. Many users of the Tria find it painful to use, while the IPL devices are not painful at all, more of very mild heat that some users may find uncomfortable but for the most part are not much of an issue. If you have had IPL in a medical spa you may have felt the treatments to be quite painful, the at-home treatments are nothing like that, even on the highest settings. Do you need eye protection? As a safety precaution, you can use protective eye goggles, but if you are using the devices correctly, you don’t need to use them since all FDA approved devices have built-in safety mechanisms that only allow the pulse of the laser or light when there is full contact with the skin. If the product is flush with the surface, it will be away from the eye. Having said this, some users may find the flash to be a bit too bright for their eyes and would feel more comfortable with protective eyewear. The iluminage Touch comes with protective goggles. These types of products can only claim to give users a ‘permanent reduction in hair growth’ because of FDA rules. However many users have found that they do see levels upwards of 70% of permanent hair removal. The results can vary drastically from individual to individual depending on many different factors. What type of skin color will a particular product work on? The ideal candidate at home hair removal is someone with white to light brown skin tone and dark hair. However, that isn’t to say that if you have a darker tone, you are entirely out of luck. You will want to look into iluminage Touch or the Me My Elos Syneron Touch systems, that have had some success treating users with darker skin. What type of hair color will it work on? Generally, IPL and Laser only work on individuals with brown or black body hair. 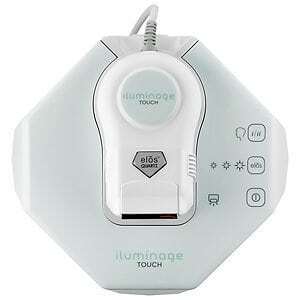 However, the iluminage Touch does claim to work on blond, dark blond and red hair as well and brown and black. How often can you use it? You usually use the products in 1 or 2-week intervals with one session per area that you are treating. By taking a break in between using the products, you are ensuring that you are hitting the hair follicle at the right point in the growth cycle. Can you get burn marks or scarring from home DIY hair removal kits? Yes, you can, that is why it is imperative that you follow the suggested recommendations and instructions from the manufacturer. 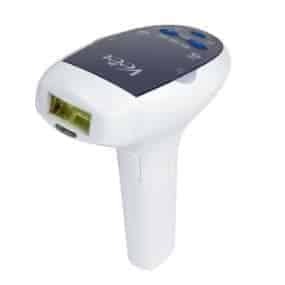 Scarring and burn marks tend to occur when you are using one of these devices on skin that is too dark for the device to be able to differentiate between the skin and darker hair. Most FDA approved products will have a skin color sensor that will stop the machine from working if you are trying to use it on a skin tone that is too dark or has a tattoo or tan. At-home hair removal systems can be the best thing that someone has ever purchased or the biggest waste of money ever. That is why it is vital to read all of the instructions and qualifications for any device you may be interested in purchasing. For many of these products you have to have the right skin tone, and the hair has to be darker than the pigmentation of the skin. For those of you who have lighter hair and darker skin look into iluminage Touch or the Me My Elos Syneron Touch to see if they may work for you. Keep your receipts and know your warranties and money back guarantees (if there is one). Also, make sure you contact the manufacturers immediately if you have a problem. Don’t get stuck with a $500 device that doesn’t work for you. Remember that everyone will get different results and there is no guarantee that you will be one of the lucky ones where it works well. If you spend some time researching the various systems and following all recommendations, you will have a much better shot of getting rid of unwanted hair in the privacy of your own home without the hassle of having to go to a professional.